Rebel Metropolis | Cycling Past the Grave of the CRC. If you ride a bike and care about safe, livable streets, you knew that ODOT boasts about better bike access over the Columbia were a sick joke after considering the massive increase in traffic coming from Washington to Oregon that 10 lanes of freeway would have incentivized. The prospect of pedaling 116 vertical feet while biking across the CRC also didn’t win over anyone in the cycling community. Then there’s the fact that CRC bike access would have been underneath the freeway deck. If you’ve ridden the Esplanade where it dips under the Morrison Bridge next to I-5, it’s unbearably loud. Now imagine that kind of noise for a mile. Yeah, no thanks. Good riddance. The CRC has rightfully gone the way of the Mt. Hood Freeway. Grassroots organizers, myself included, are throwing a party at Velo Cult to celebrate this fact, the event page for which can be found HERE. Moving along, the second bit of rockin’ good news comes from New York City, where a newly christened bike share program has become an overnight success. Despite the NY Post’s dire warnings of the coming bicycle apocalypse once the program launched, New Yorkers have enthusiastically (and quite literally) jumped all over the fledgling bike rental service. In just a few weeks, over half a million trips have been taken on the armada of cobalt cycles. Added to this good news is that fact that the self-righteous safety patrollers insisting helmets be mandated in the program, (because America has a safety fetish when in comes to injury, but not when it comes to ruining our bodies with pollution and McFood), now have to grapple with the fact that after half a million trips, there were only three minor injuries. Crisis averted. 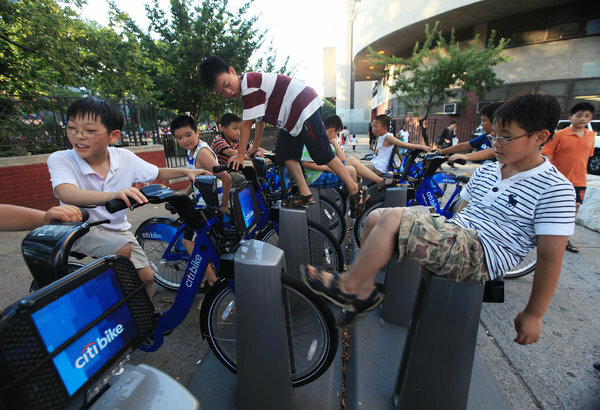 As covered in the NY Times, not only are the bikes a hit, the docking stations themselves have proven to be an immensely popular new oddity for New Yorkers to explore and creatively appropriate. Obviously, NYC isn’t the first American city with a bike share program. Washington DC has one, and it is wildly successful there, too. Yet with such an overflow of criticism from people who know nothing about bikes and feel far too comfortable with NYC streets dominated by space-hogging autos, the response to this program seemed to be a make or break moment in our maturing process as a cycling nation. My only real problem with all this is that each and every bike in NYC’s fleet bears the logo of sponsor Citibank, a financial institution responsible for destroying the lives of countless Americans through predatory lending and foreclosures. Citibank’s soulless business model also played a major role in decimating the U.S. economy. Ok, back to bikes. New York City has a bike share program that people are learning to love. If designers Alta Bicycle Share can resolve scheduling delays and labor disputes, Portland may just get its own system online next year. Cross your fingers. The third and final positive sign of changin’ times also comes from New York by way of the Wall Street Journal. 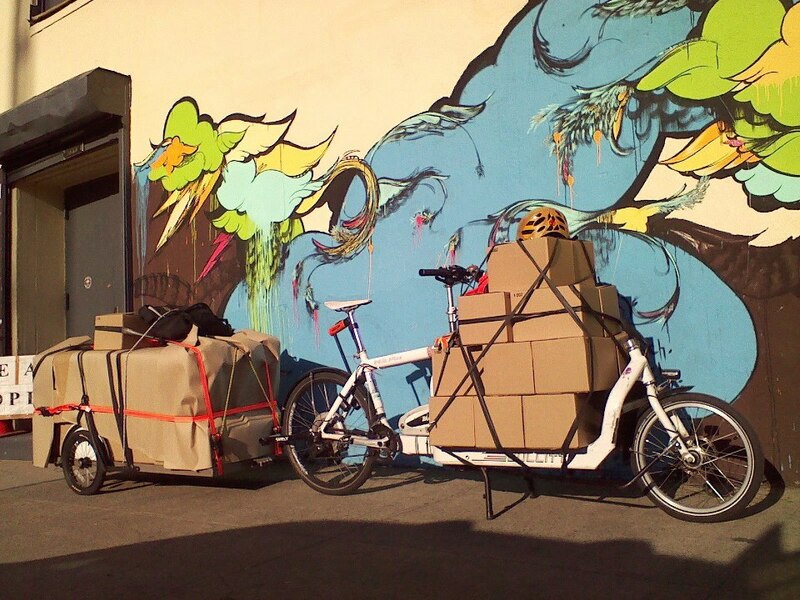 In a piece entitled Cargo Bikes: The New Station Wagon, livable streets advocate and ‘Traffic‘ author Tom Vanderbilt chronicles the decline of automobiles alongside the simultaneous upsurge in cargo hauling bicycles. What makes this piece stand out so much is two-fold. Vanderbilt is obviously in the cycling camp, but what he does in this piece is subtly brilliant. Image courtesy of NYC Cargo Bike Collective. So not only has NYC’s bikeshare become commonplace and well utilized in just a matter of weeks, but now the paper of bourgeois financial record is heralding the routinized normality of hauling kids and groceries via metrofiet. As the cherry on top of a delicious freeway defeat confection here at home, last week’s NYC bike bliss feels like one large step for cycling mankind in our country. Clearly we’ve got light years to voyage if we plan to compete with Denmark, Germany, or the Netherlands. For now, I’ll relish how far we’ve come. Portland, with help from her conservative comrades to the North have continued a proud tradition of rejecting freeways in favor of bike boulevards and public transit infrastructure. We slayed the CRC. I’ll remember this fact fondly each and every time I ride my bicycle. Top thumbnail image courtesy of Jonathan Maus/Bikeportland.org. Pingback: Rebel Metropolis | Portland Reaches 25% Cycling Mode Share!